Get a light bite with these round mini pressed powder candies. 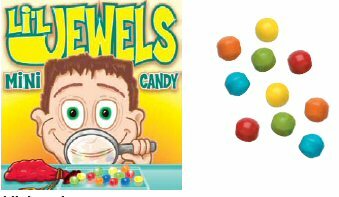 These little treasures are made for vending in candy machines and their bright colored coats will always shine to attract attention to themselves in candy vending machines. This mix includes Fruit (White), Lemon (Yellow), Cherry (Pink and Red), Lime (Green), and Grape (Blue). These sweet treats are also great for decorating cakes and other desserts. Need a machine to vend these itsy-bitsy candies? Be sure to see our full line of candy vending machines.